Drawing is easy with eyes closed. Jeremyville at the Bondi Beach Studio. Quick sketch, at the café below my studio today. The Tomorrow Forest. 4 nights. Signed photographic print 112 cm x 87 cm. SUCCUMB to The 'Anti Sweden in Jeremyville' denim collab! Just released is Jeremyville's first denim collaboration with one of the coolest and darkest labels to come out of the low countries: Anti Sweden Jeans from Norway. hope you dig it. The True Norwegian Black Denim label 'Anti Sweden' is launching a limited edition jeans collab with the legendary Australian & New York based artist Jeremyville. Anti Sweden's styling of evil and darkness have merged with the distinct 'Acid Pop' line work of Jeremyville, who has interpreted the grim and provocative motives of Norwegian death metal, and created a surreal and menacing landscape of carnage and destruction. Jeremyville has drawn wolves devouring cadavers, live human sacrifice, and abandoned babies, to create a scene of apocalyptic hell, which is meticulously screenprinted onto the pockets within the grim blackness of the denim. Alongside the limited edition of 666 jeans comes a giant collectors' edition screenprint, each signed by Jeremyville himself. 1 of these special 400 screenprints comes with the purchase of each of the first 400 jeans. The price is 1666,- Nok, (280 USD) and if you are up for wearing a limited edition collab of dark underworld art and fashion, this should be right up your dimly lit alley. The giant 'Anti Sweden in Jeremyville' screenprints are divided into a run of 200 fluorescent yellow and 200 fluorescent pink, reminiscent of giant band posters found pasted on the streets. An innovative project from 2 very unique creative forces working in the world today. launched a seri of jeans labels. Black Metal is going fashion. 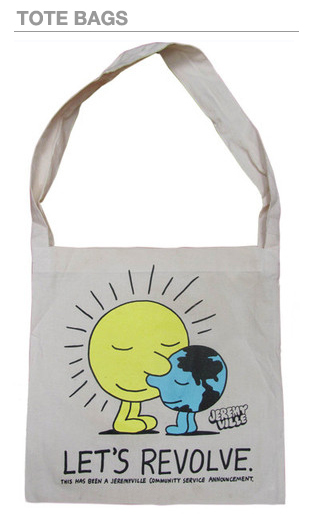 Anti Sweden have previously done collaboration work with the gore artist Justin Bartlett and illustrator Minnie Havas and we are glad to continue our exclusive list of collaboration partners with one of the most admired illustrators in the world today, Jeremyville. His interpretation of evil and darkness combined with his signature style ended up better than we could ever imagine from our darkest fantasies. Its a study in storytelling thru a set of intricate details that you need to dive into. 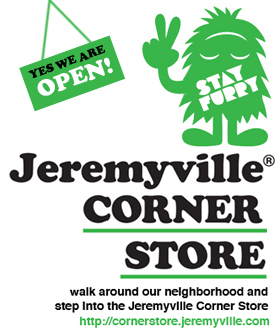 Jeremyville is an artist, product designer and author. He wrote the first book in the world on designer toys called 'Vinyl Will Kill', in 2003. He has also written and produced his 2nd book 'Jeremyville Sessions', (published by IdN) and has had several designer toys released through Kidrobot. He has been in group shows at Colette Paris, the Madre Museum Napoli, the 796 Arts District in Beijing, the Andy Warhol Museum in Pittsburg, and Giant Robot in New York. Converse recently released 2 Jeremyville Chuck Taylor high tops, and Juxtapoz recently featured Jeremyville in a 12 page article. He now splits his time between his 2 studios in Nolita New York, and by the ocean at Bondi Beach in Sydney. He wears a black pair of Anti Sweden jeans almost every day. 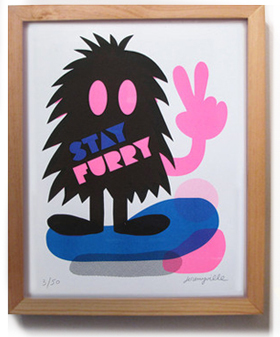 The Jeremyville Online Store will be releasing a very few pairs of this collab, and also some of the signed fluoro giant screenprints for sale shortly, so register your interest by emailing Liz at news@jeremyville.com.